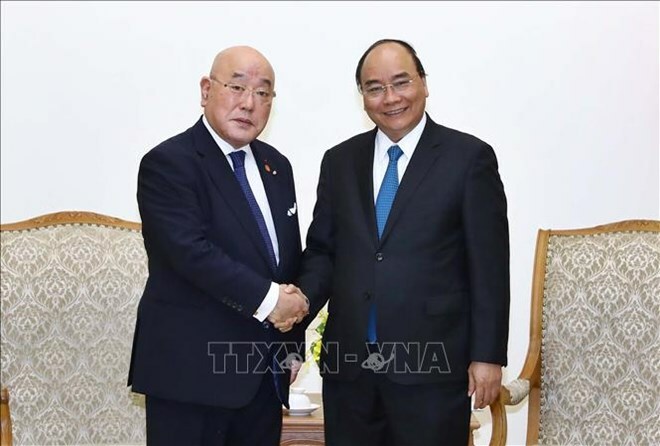 Hanoi (VNA) – Prime Minister Nguyen Xuan Phuc lauded the strong growth across all fields of the Vietnam-Japan extensive strategic partnership as he received Special Advisor to the Japanese Cabinet Isao Iijima in Hanoi on March 29. PM Phuc especially mentioned that he and his Japanese counterpart Shinzo Abe have worked closely together to boost bilateral relations in economy, trade, investment, and tourism. Vietnam is hosting the 2019 Japan Cherry Blossom Festival – a big cultural event for both nations, contributing to their cultural and people-to-people exchanges, the PM noted. For his part, Iijima said it is the sixth annual edition of the festival in Vietnam, stating that Japan appreciates the Vietnamese side’s close coordination for the event. He unveiled that on the occasion of this year’s festival, the Japan Cherry Blossom Association has selected two Vietnamese goodwill ambassadors to play a role in boosting bilateral cultural exchange. Iijima noted that Japanese PM Abe is looking forward to PM Phuc’s attendance at the upcoming G20 Summit in Osaka, Japan, so that the two leaders can discuss measures to enhance bilateral ties. The advisor said with delight that under PM Phuc’s direction, Vietnam is speeding up its study to build a project for smart city development, considering the move a good opportunity for Japan, an experienced country in the field, to cooperate with Vietnam. As economic exchange between the two nations’ business communities is growing stronger, the advisor hoped that there will be more Vietnamese firms collaborating with the Japanese side, particularly in becoming active members of the KEIDANREN (Japan Business Federation). PM Phuc said the Vietnamese people are pleased with the fruitful outcomes of Vietnam-Japan cultural and people-to-people exchanges.